The Geelong RSL today is a much different establishment from the organisation which formed more than a century ago but its charter remains the same – to honour, support and care for Australia’s service men and women. The RSL has its roots in the foundation of The Returned Sailors and Soldiers Imperial League of Australia in 1916, and Geelong was right there at the beginning, forming its own branch with a Lieutenant Sandford as chairman. With the First World War generating a new army of veterans and ensuring momentum for the cause, the Geelong branch of the RSSILA was quick to follow its foundation meeting with the opening of clubrooms at 231 Moorabool Street in September, 1916. Cr William Brownbill officially opened the clubrooms, with The Geelong Advertiser newspaper reporting that “a procession of 55 Geelong district ANZACs, several of them scarred and limping commanded by Captain Jacques and Lieuts. Copp and Palstra and headed by the City Band, attracted a good deal of notice”. Formation of a Geelong women’s auxiliary followed in 1921 and in 1932 the Geelong group built and opened a hall of honour which was popular entertainment destination, particularly for dancers, until the hall sold to the YMCA in the 1950s. In 1940 the RSSILA changed its name to the Returned Sailors’ Soldiers’ and Airmen’s Imperial League of Australia and in 1953 Geelong launched a new returned servicemen’s club, officially opened by the league’s Geelong president Cr J. Dowsett. Another name change took place in 1965, this time to the Returned Services League of Australia, and then another in 1983, to the Returned Services League of Australia Limited. 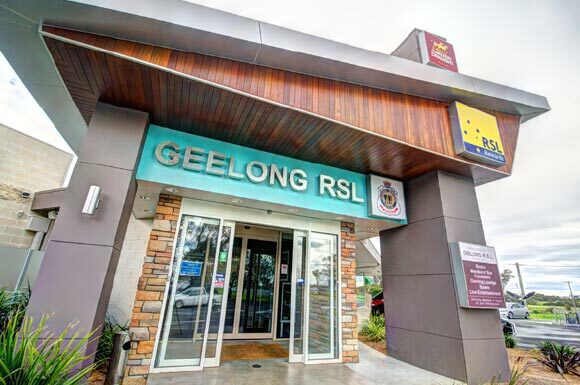 In 1990 the RSL adopted another name, this time becoming the Returned and Services League of Australia Limited, and that same year Geelong RSL opened its new clubrooms in the Belmont location where it resides today. Outspoken RSL president at the time, Bruce Ruxton, opened the new Geelong RSL and its facilities included a bistro dining room and meeting rooms, which were the talk of the town. The Geelong RSL had 1550 members in 1990, and sporting facilities in the new club included three billiard tables, two bowling greens to rival any Geelong bowling club and carpet bowls facilities. With its popularity ever growing, Geelong RSL club underwent extensions in 1999, including the addition of a returned veterans’ retreat and library above the members’ recreation room and bar, and a new board room, providing community groups with a quality function centre and venue hire opportunity in Geelong. Never far from the news, Geelong RSL won the Victorian Collections Award for Excellence in Museum Cataloguing (Military Memorabilia Collection) in the 2015 Victorian Museum Awards, winning for its outstanding records in terms of its images, historical information and significance statements. Geelong RSL’s latest developments include carpark expansion to fit 155 cars, extensions to the front of the building and an impressive children’s play area. The Geelong RSL club is proud of its rich history and will continue its important work to current and former service men and women and the wider community. If you’d like to find out more about the RSL in general, become a member of Geelong RSL or attend one of our many and varied events, make sure you get in touch with us. We’d love to hear from you.